Wesley and the Rangers won all three of their games this past weekend against the Vermont Lumberjacks, jumping past their North Conference rival for 1st place in the standings. Wesley had a goal in each of the three games, starting with a hat-trick in the 7-3 victory on Friday night. The forward continued the scoring the next day by picking up two points in the 5-1 Rangers win, and then in the series finale, Wesley added another goal and assist to his weekend totals to help his team to a 5-4 win. With the eight total points on the weekend, the forward now has 33 on the season with 18 goals and 15 assists. Up ahead for Wesley and the Rangers is a home-and-home series with the Valley Jr. Warriors this upcoming weekend. Merrigan and the Express won all three off their games this past week, against three different opponents by a combined score of 15-6. The 2000 defensemen picked up an assist in the team’s 5-1 win against the Valley Jr. Warriors on Friday, and then followed things up with a goal and an assist in another 5-1 win the next day against the New England Wolves. 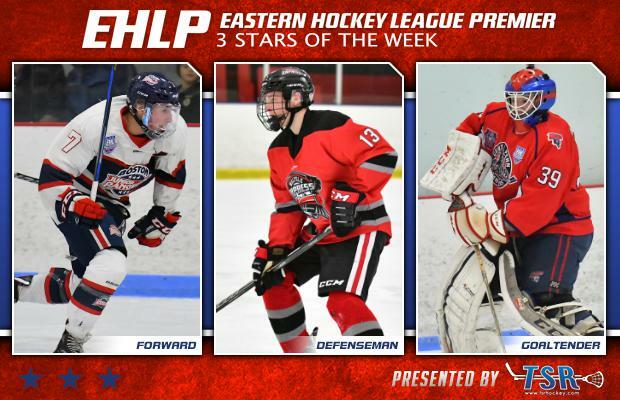 Merrigan and the Express went on to take care of business on Sunday in Brewster against the New York Applecore, as the defensemen tallied another assist in the 5-4 victory. In total Merrigan racked up a goal and three assists over the weekend, and with those 4 points, he now has a total of eight points in 13 games so far this season. Walpole is now off until Saturday, December 16th when they host the Boston Jr. Rangers. Baldacci and the Panthers split their home-and-home series with the New Jersey Renegades, with the '97 netminder in between the pipes for the victory on Sunday. After losing 6-2 on the road on Saturday, Baldacci served as a much needed anchor at home, stopping 64 of the 68 shots sent his way. The stellar performance gave Baldacci his third win of season, and his second in his past three starts. Combining those two wins together, and Baldacci stopped 104 of 106 shots sent his way. The Panthers will look to lean on their goaltender in a similar fashion this weekend as they head North for a pair of matchups with the Vermont Lumberjacks. 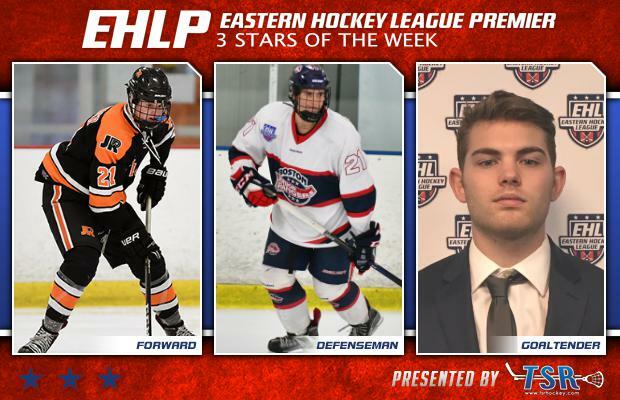 The EHLP would also like to recognize a set of honorable mentions, for players that delivered "star-worthy" performances.